Kelly Zimmerman holds her son Jaxton Wright at a parenting session at the Children's Health Center in Reading, Pa. The free program provides resources and social support to new parents in recovery from addiction, or who are otherwise vulnerable. 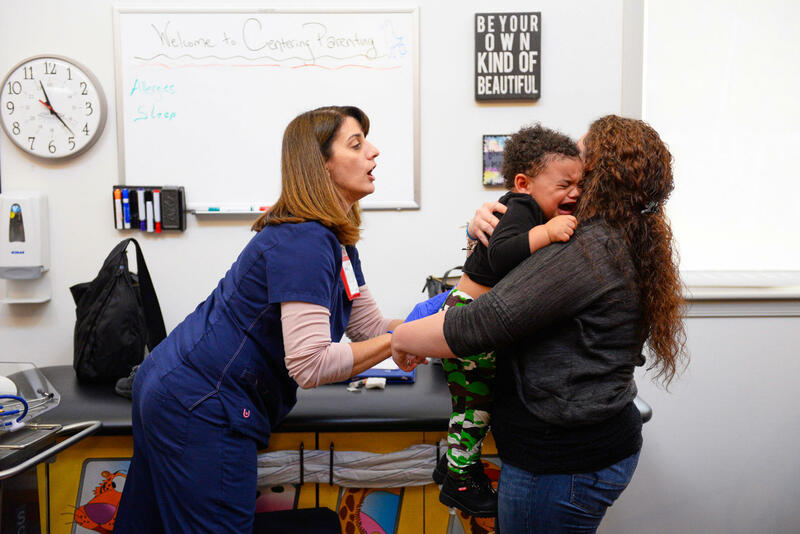 Cynthia Dimovitz, a pediatric Certified Registered Nurse Practitioner at the Children's Health Center, holds Jaxton's hand as she gives him a checkup during a Centering Parenting session. Kelly Zimmerman holds her son, Jaxton, outside their home in Douglassville, Pa. Kelly moved in with her parents before Jaxton's birth; the baby's father died in July of 2016 from a heart attack. 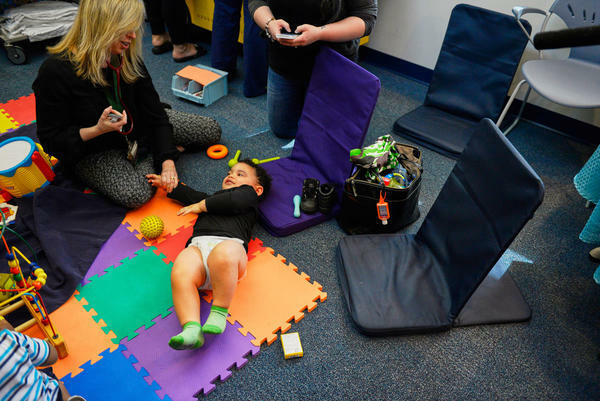 Kelly (right) comforts her son after his hepatitis vaccination at the Children's Health Center in Reading, Pa. The baby's birth motivated her to do whatever it took to avoid relapsing into addiction, she says. "I was in love with him." Mother and son take a play break near their home in Douglassville, Pa. "I'm really lucky, Kelly Zimmerman says, because my family has made a lot of adjustments — a lot of changes to help me get back on my feet." Jack Zimmerman (right) has been a key player in his daughter, Kelly's recovery, driving her to all her appointments and helping her take care of her young son Jaxton (left). 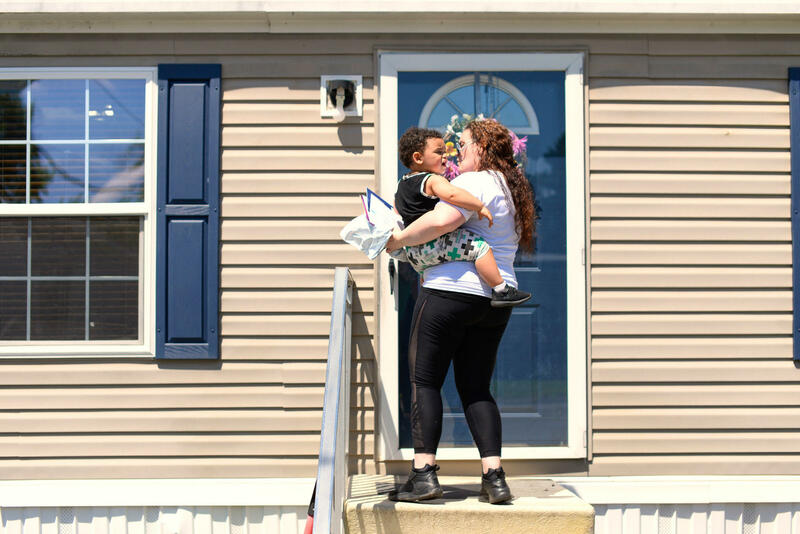 Kelly Zimmerman says she'd like to find a home for herself and her toddler — so she doesn't have to depend on her parents so much — but that may not happen soon. She still has financial debt from her years of addiction. For most of her childhood, growing up in southeastern Pennsylvania, Kelly Zimmerman felt alone and anxious. She despaired when her mother was depressed or working late shifts; when her parents fought nonstop; when her friends wanted to come over, and she felt too ashamed to let them see her home's buckling floor, the lack of running water. Kelly tried to shut out those feelings, and when she was 18, a boyfriend offered her an opioid painkiller — Percocet. Her anxiety dissolved, at least for a little while. "It was wonderful," she remembers thinking. "Where has this been my whole life?" Soon she was hooked, first on prescription painkillers and then on heroin. For years, Kelly was content to live — and, she says, maybe even die — on drugs. Then, in 2016, when she was 26, she gave birth to her son Jaxton, and new feelings rushed in. "I was in love with him," she says. But it was hard from the start. Kelly was a single mom and grieving — the baby's father had died just months earlier from a heart attack. She was on methadone to treat her heroin addiction, which meant that when Jaxton was born, he went through opioid withdrawal. "He was kind of stiff, tightening up his arms and legs" Kelly remembers. "He was a little shaky. And he had one of those high-pitched cries." Jaxton had to spend his first weeks in the neonatal intensive care unit at Reading Hospital. Watching him struggle, the new mother felt guilty and ashamed. She visited every day and made him a promise: "I need to make this up to you somehow. I'm going to be here to go through this with you. If you have to be here, I'm going to be here." Kelly was determined to do whatever it took to get Jaxton better, and to raise him well. But federal and state statistics suggested that the chances she'd be able to do that on her own were slim. 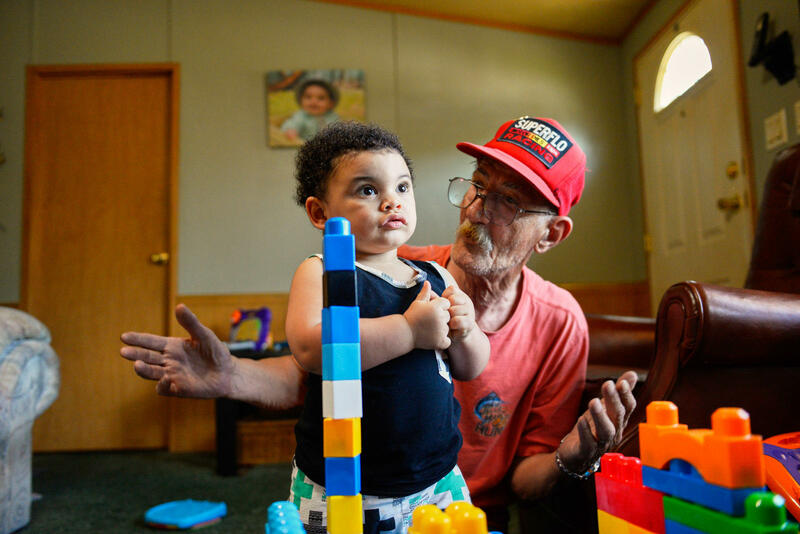 In 2016, the year Jaxton was born, about 92,000 children were removed from their homes nationally because at least one parent had a problem with drug abuse. After a decade of steady decline, the number of children in foster care had risen by 10 percent between 2012 and 2016, in large part because of the opioid epidemic, according to the U.S. Department of Health and Human Services. And regions with higher rates of deaths from drug overdose and drug-related hospitalizations have higher rates of placements in foster care. "Removal of a child [from its parents], while sometimes absolutely necessary, causes trauma in that child at a very early age," says Valerie Chandler, the former program director of the Berks Parents Services Collaborative Program, designed for mothers with addiction, at the Children's Home of Reading. Studies show that many kids entering the foster care system go through long periods of instability, moving from one foster home to another, and often have long-term mental health needs that go unmet. Nonetheless, for many years in Berks County, new mothers like Kelly — fresh on the path of addiction recovery — had their newborns routinely taken away and put in foster care, often directly from the hospital, Chandler says. The impact on the moms was devastating, too, she says. "Ninety percent of mothers went out and got high as a kite." And that, in turn, reduced their chances of getting their babies back. To understand the spiral, Chandler says, put yourself in these women's shoes. "So, you're a new mom. You were using opiates, and now, you know, the hammer's coming: The county's coming to get you; your family is going to be all over you. You're going to lose this child, and you screwed up. Throw in some new-mom hormones," Chandler says, "and you're a basket case. 'Oh, and by the way, don't use drugs anymore.' Right? Your one coping skill is gone." The county's traditional way of handling these cases — common in other states, too — was inadvertently setting up these women to fail. So, in 2016, Chandler and her colleagues got together with the county and other local institutions, like Reading Hospital, to come up with a different approach to help these mothers and their babies. Instead of waiting for the baby to be born, the county's social workers would meet with each opioid-addicted woman during her pregnancy, and identify and enlist an extended network of family or friends. To help the new mother retain custody of her child, the family would commit to supporting her in major ways — helping her find a way to stay in treatment and take on the new responsibilities of motherhood. The collaborative adapted a program called Family Group Decision Making to help the pregnant women and their supporters develop a concrete plan — with clear obligations and consequences. County social workers put in hours of work upfront, interviewing the pregnant woman and identifying the members of her family or close community who will support her. Next they interview each family member, delving into relationships and identifying whatever additional support from the county the family will need if they're going to make this work. Then, the whole team — family members, the pregnant woman and the county social workers — get together for a frank talk about the strict conditions under which the county will allow the baby's parent or parents to retain custody. Back-up plans are spelled out, too: Should the new mom relapse, who in the family would step in to take care of the child? The family is tasked with figuring out particular ways each member will support the mother in her daily life, so that staying in treatment and taking care of the baby becomes more feasible. Finally, the pregnant woman and her family draft a written plan of action that all players — including the county officials — must sign. "It empowers the family members as well," says Chandler, who's now a program manager at the Opioid Use Disorder Center of Excellence at Reading Hospital. And it lets the mom know where to turn for specific support. "It's very good at giving [the women] hope, and a sense of belonging," says Chandler, "and a sense that people care about them and their baby, regardless of what happened in the past." In 2016, Zimmerman was one of the first pregnant women with addiction to go through Family Group Decision Making in Berks County. Since then, Berks County Children and Youth Services has worked with 20 more women like her. Only one mom who has completed the program has had to have her child placed in foster care; and two others had their babies placed within their extended family. Eighteen still have custody of their children. Being able to even come up with a plan, let alone asking for help in sticking with it, was new for Kelly. During the eight years that she was addicted to opioids, she pushed nearly everyone away, especially her siblings and parents, and was often living out of hotels with her boyfriend, who was also her drug dealer. "Sometimes we wouldn't hear from Kelly for, it seemed like, months," says her middle sister, Jessie Palmer. Holidays and family celebrations came and went without a call, or with empty promises. "My mom would hold on to that hope ... thinking, 'She's going to show up,' " Jessie says. The family waited, but Kelly never arrived. Though Kelly and Jessie are 10 years apart in age, the two sisters were emotionally close growing up. And Jessie says that during all those years of Kelly's addiction, she missed her baby sister and worried about her. "It hurt a lot," Jessie says. "It made me feel kind of helpless — the fact that I couldn't be in her life, that I didn't even know how to contact her, a lot of times." The day Jessie learned that Kelly was pregnant, was a very dark day, Jessie says. "I was like 'how is this going to work?' " Jessie says. "That just threw worry into overdrive." 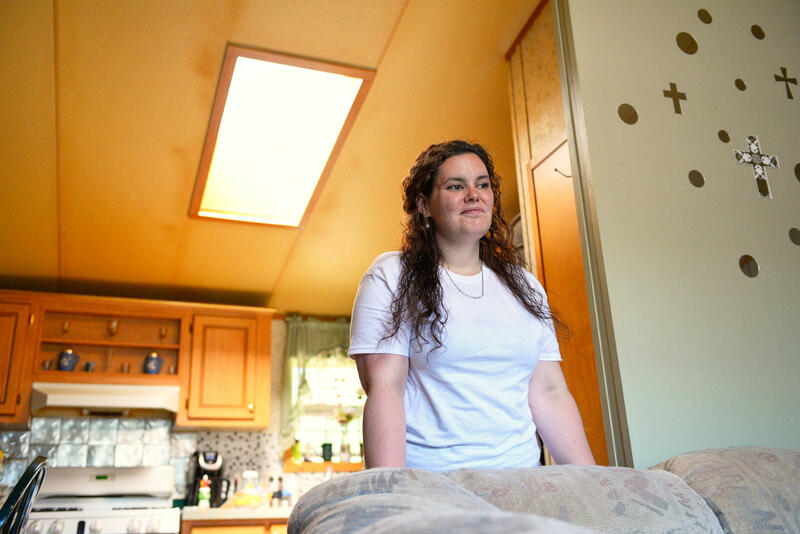 Broke and desperate, Kelly moved in with her parents. 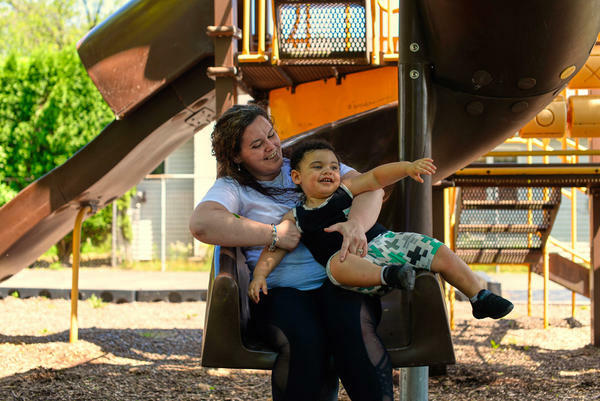 Fortunately for the family, Kelly decided to turn to nearby Reading Hospital to get methadone treatment for her addiction, and to start prenatal care. And that's when things started to turn around. The hospital connected her to a case worker: Christina Cortez from the Berks Parents Services Collaborative Program. "She was actually quite honest with me," says Cortez — honest about her addiction and ready to do the hard work ahead. Though Kelly remembers being skeptical. "It was a two- to three-hour meeting of sitting with my family, talking about my problems," Kelly says. "I didn't want to do that. Who does?" Still, she agreed. She couldn't bear the thought of relapsing and losing her child. 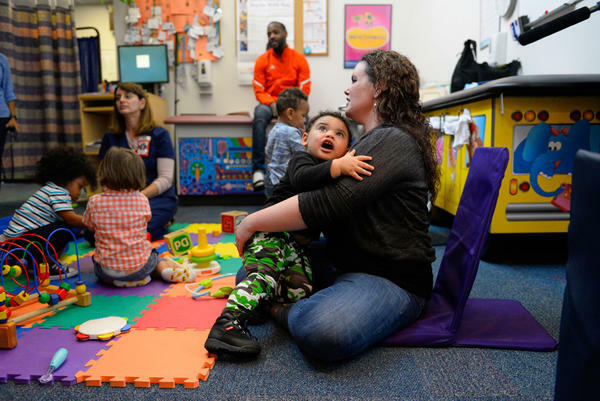 "Family Group is great for mothers who are experiencing opioid addiction, because it brings the entire family together for a really good [reason] — the baby's birth," says Jennifer Wallis, a social worker for Berks County Children and Youth Services. "I mean everybody gets excited about a new baby. Don't get me wrong — they're definitely worried. But they're excited about the baby being born. So why don't we use that for the good of the cause?" On the day of the actual meeting, Kelly sat next to Cortez at the head of the table. On one side was her family, on the other side, Wallis and her colleagues from Children and Youth Services. Kelly was very obviously nervous that her family wouldn't embrace her, Cortez says. But with a little guidance, the family came to see that they could all set aside their past disappointments. They were heartened that Kelly had signed up for every class and resource offered to her by the county, and was on track with prenatal care and her methadone treatment. If Kelly did relapse, the social workers explained, someone in the family would have to take custody of Jaxton. Kelly's oldest sister stepped up for that role, and her sister Jessie volunteered to help out on weekends. There was also an addiction expert at the meeting, at the family's request, who explained what goes on in the brains of people with addiction and answered the family's questions about methadone treatment. "I think that was a pivotal moment for her family," Cortez says. That's when they realized that addiction wasn't just Kelly's choice, but a mental health problem. Jessie Palmer says articulating and writing down a plan of action was the game changer that day for them all. "That's something we would have never done on our own," she says. "And they sent it to us as, like a contract ... to sign — like this is the plan you committed to." Jessie says she was thrilled to be finally part of Kelly's plan — to help figure out things like who would take Kelly to her appointments, and who would babysit Jaxton. By the end of the meeting, Kelly was feeling much less alone. "I'm really lucky because my family has made a lot of adjustments — a lot of changes to help me get back on my feet," she says. Her support system has continued to expand. Cynthia Dimovitz, Kelly's pediatric Certified Registered Nurse Practitioner at Reading Hospital's Children's Health Center, signed her up for a new form of pediatric care, called Centering Parenting. The program offers periodic two-hour sessions to groups of vulnerable moms and their babies, during the child's first two years of life. The babies get a standard health check-up each time and the mothers get parenting classes. They also share their struggles and frustrations. "I don't have enough mom friends," says Kelly. "Just having other moms and people to relate to, was a big thing for me." Kelly and Jaxton, who is now 19 months old, and a strong, healthy toddler, have been attending these appointments ever since he came home from the hospital. She says it's helped ease her sense of isolation. Though Kelly dotes on Jaxton, her life is still stressful. "I definitely go through times of feeling hopeless or very overwhelmed," she says. She'd like to find a home for herself and her toddler — so she doesn't have to depend on her parents so much — but that may not happen soon. Kelly still has financial debt from her years of addiction. "At some point, I'll be able to give [Jaxton], a nice house, a yard, good school — all of that," Kelly says. "I feel like I'm not exactly where I want to be with what I want for him. But better than where I thought I would be at this point. I'll get there." That is Kelly Zimmerman, a 27-year-old mom in Reading, Pa., giving her toddler Jaxton a bath. ZIMMERMAN: Your little piggy toes are all wrinkly already. GREENE: Zimmerman was addicted to heroin for years. Many women in her situation end up having their babies put into foster care. The country's opioid crisis has only made this worse. As part of an NPR-wide project on parenting, NPR's Rhitu Chatterjee tells us about Zimmerman's fight to defy the odds and keep her baby. RHITU CHATTERJEE, BYLINE: For most of her life, Kelly Zimmerman felt alone and anxious when she was a child and her mother suffered episodes of depression or had to work the late shift. ZIMMERMAN: My mom worked at night. CHATTERJEE: When her friends wanted to come over. ZIMMERMAN: What does your house look like? CHATTERJEE: And she felt too ashamed to let them see their buckling floor. ZIMMERMAN: We didn't have running water. CHATTERJEE: Kelly learned to shut out a lot of feelings. Then, when she was 18, a boyfriend offered her a painkiller - a Percocet. ZIMMERMAN: To me, I was like, oh, where has this been my whole life? CHATTERJEE: For years, she was content to live and, she says, maybe even die on drugs. But then, when she was 26, she gave birth to her son, Jaxton. ZIMMERMAN: (Laughter) Like, I was in love with him. You know, this is my baby. (Laughter) Like, it was, like, a good overwhelming, kind of I-don't-really-know-how-to-feel type of feeling - like, a-lot-of-feelings feeling (laughter). CHATTERJEE: But Kelly knew that she and Jaxton had a tough road ahead. She was a single mom and grieving. Her son's father had died recently from a heart attack. She was also on methadone. And so when Jaxton was born, he suffered from opioid withdrawal. ZIMMERMAN: I just felt like crap because I did this to him. You know, like, I know what it's like to go through those withdrawals, and just feeling like I want to die. CHATTERJEE: Kelly visited Jaxton every day in the neonatal intensive care unit, and she made a promise to him. ZIMMERMAN: I need to make this up to you somehow. If you have to be here, I'm going to be here. CHATTERJEE: She was determined to do whatever it took to get Jaxton better and raise him herself. But on her own, the chances of doing this were slim. The year her son was born, 92,000 children throughout the U.S. were removed from their homes because at least one parent had a problem with drug abuse. Kelly worried that if she relapsed, her son would be taken away from her, too. Valerie Chandler manages the Opioid Use Disorder Center at the Reading Hospital. VALERIE CHANDLER: OK. You're a new mom. You just gave birth. CHATTERJEE: She says, imagine for a moment what women in Kelly's situation are going through. CHANDLER: So you were using opiates, and now you know - you know the hammer's coming. The county's coming to get you. You're going to lose this child, and you screwed up. Oh, and, by the way, don't use drugs anymore. Right? Your one coping skill is gone. CHATTERJEE: Drugs were Kelly's only coping skill. And while she was using, she pushed everyone away. CHATTERJEE: Her sister, Jessie Palmer, agonized over her baby sister. PALMER: There's a couple pictures that always flash in my mind when I think about Kelly. One was at a wedding where she was dancing with me. And I remember - I'm sorry. I'm going to cry (crying) 'cause that was always the picture that I would send to her when I would tell her that I missed her. CHATTERJEE: Jessie didn't hear from her sister over the years. And then came the news. PALMER: What's going to happen here? CHATTERJEE: So she confronted her sister about it. PALMER: You're less than three months till you're going to have this baby. Like, what are you going to do? ZIMMERMAN: She was like, well, what's your plan? And I was just like, I don't have a plan. I don't know. CHATTERJEE: A plan - a plan to get clean, to get organized around a new baby in the home. Kelly knew she needed a plan, but she didn't know where to start. So she went to Reading Hospital and signed up for every service she could find. The hospital referred her to Berks Parents Services Collaborative. Social workers there knew that without a plan, moms like Kelly can crumble under the stress. CHRISTINA CORTEZ: I'm here to help you. CHATTERJEE: But to do so, Kelly would have to agree to a meeting with the county's Children and Youth Services and her family. CORTEZ: She didn't like me very much around this time 'cause she thought it was the stupidest thing. ZIMMERMAN: It was, like, a two-, three-hour meeting of sitting with my family, talking about my problems. Like, I didn't want to do that. Who does? CHATTERJEE: But she knew she had to do it because she couldn't bear the thought of relapsing and losing her baby. On the day of the meeting, Cortez says Kelly was nervous. CORTEZ: And scared that her family won't embrace her. CHATTERJEE: But the family was eager to help, she says. They just didn't know how. And they didn't understand Kelly's addiction. So Cortez and her colleagues brought in an addiction expert. CORTEZ: And I think that was a pivotal moment for her family. PALMER: A plan - yay. You know, now she needs us. You know, now we have to be part of her plan. ZIMMERMAN: Who is going to take Kelly to her appointments? Who's going to watch Jaxton if, you know, I need them to? CHATTERJEE: Kelly finally saw that she had help. Reading Hospital's Valerie Chandler says society expects women in Kelly's situation to do it all on their own. CHANDLER: Like, we ask people to do these incredibly difficult things without any thought about where they really are. CHATTERJEE: And that, she says, just sets them up to fail. CHATTERJEE: Jaxton is now a healthy, rambunctious toddler with a big smile and a head full of curls. CHATTERJEE: Kelly has been clean for two years. She and Jaxton now live with her parents, and she has a whole team of people standing by her, making sure that she and Jaxton can stay together. Rhitu Chatterjee, NPR News. ZIMMERMAN: Left foot, right foot. (SOUNDBITE OF HANS WOLFGANG ZIEGLER'S "SUNNY AND CLOUDY") Transcript provided by NPR, Copyright NPR.